Preorder your Canon EF 100-400mm L IS II USM Lens now at B&H. Nashville, Tenn. – December 29, 2014 – Professional Photographers of America (PPA) announced today the charitable events coming to Imaging USA, Jan. 31 to Feb, 2, 2015, at Opryland in Nashville, Tennessee. PPA Charities, the philanthropic arm of PPA, will host events and sponsor programs during the association’s annual convention and expo. Imaging USA attendees can kick things off Saturday, January 31, from 5 to 7 p.m. with the free program, How to Put Charitable Marketing to Work. Moderated by esteemed photographer and business coach, Ann Monteith, M.Photog.Hon.M.Photog.Cr., CPP, ABI, API, A-ASP and Lori Nordstrom, M.Photog.Cr., CPP, the panel also features Larry Lourcey, M.Photog.Cr., CPP; Dean Lourcey, Pete Rezac, Cr.Photog., CPP and Meggan Harper. The panel will share with photographers how a charitable marketing program can bring goodwill and recognition to their business, attract new clients plus create additional revenue to boost profits – all while giving back. The goodwill continues Saturday night at the 8 p.m. PPA Charities Celebration: Boots and Bling. This event recognizes the philanthropic endeavors of 2014 and features a live auction. It’s open to any Imaging USA attendee and a great place to get started for anyone looking to partner their business with a charitable mission. The following morning, photographers can hit the ground running bring and early at the PPA Charities Super Hero for Smiles 5K Fun Run and Walk. Runners and walkers alike will unite for a 3.1-mile loop around Opryland to raise funds for Celebration of Smiles. 6:30 a.m.
Those who really want to be more charitable can kick off their sneaks after the run and drop them in bins by the Imaging Expo for the PPA Charities shoe drive for Dando Amor, running all convention long. All attendees are encouraged to bring their old and little-used shoes to be re-purposed for orphanages in South America and Africa. Lastly, on Tuesday afternoon, photographers Trish Gilmore and Mariah Ashley will share with the crowd how they turned around their fledgling business while dedicating a portion of every sale to charity. Photographers must be registered for Imaging USA to attend the events and programs. For more information on PPA Charities’ events and to register for Imaging USA, visit ImagingUSA.org. 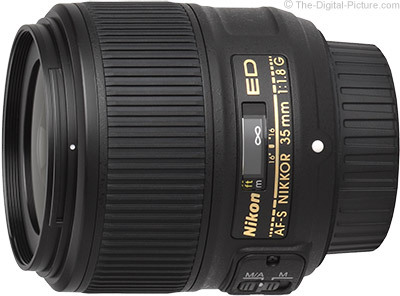 Standard test results are now available on the Nikon 35mm f/1.8G AF-S Lens Review page. B&H has the Nikon 35mm f/1.8G AF-S Lens in stock. B&H Presents "Top Ten Tips for Targeted Adjustments in Photoshop"
Tim Grey will will provide you with his top ten tips for making the most of selections, layer masks, and other features to enable you to apply targeted adjustments to your photos. Adobe's Photoshop Photography Program is only $9.99 per month (Photoshop CC + Lightroom). Permalink: B&H Presents "Top Ten Tips for Targeted Adjustments in Photoshop"
What is Your Favorite Gear of 2014? We gave you our favorites for 2014, but we were wondering....what made your list for the most exciting new gear of 2014? 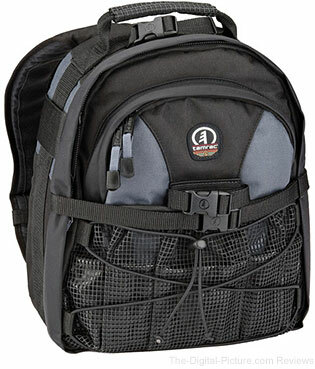 Permalink: What is Your Favorite Gear of 2014? Sigma Corporation would like to announce the availability of two types of new tele converters. Please note that the SIGMA 120-300mm F2.8 DG OS HSM | Sports requires an update to the firmware to make it compatible with the SIGMA TELE CONVERTER TC-1401 and SIGMA TELE CONVERTER TC-2001. For those who own the SIGMA 120-300mm F2.8 DG OS HSM | Sports and considering using it with either the SIGMA TELE CONVERTER TC-1401 or SIGMA TELE CONVERTER TC-2001, please follow the steps below to update the firmware of the lens. Please be advised that the updated version of firmware will make it compatible with the new tele converters, however it will also make it incompatible with conventional APO TELE CONVERTER 1.4x EX DG and APO TELE CONVERTER 2x EX DG.For further information, please contact your nearest authorized subsidiary / distributor of SIGMA. Please start up the SIGMA Optimization Pro software and update the firmware of the SIGMA 120-300mm F2.8 DG OS HSM | Sports. There will be the optimized firmware compatible with the new tele converters (Sigma: Ver. 1.01, Nikon: Ver. 1.02, Canon: Ver. 1.03), currently scheduled for release on October 24th. We are going to start the service for update on October 27th. Please contact our Service department with any further detail or question. * Apart from the lenses in the table, new tele converters are not compatible. B&H carries the Sigma TC-1401 and TC-2001 Teleconverters and the USB Dock. There were a modest number of new products announced during the last twelve months. Most of the newly announced products were interesting or impressive for one reason or another, but only a handful made us smile every time we touched the gear. Below you'll find our top picks for the gear released in 2014. Sigma 50mm f/1.4 DG HSM Art Lens – The highly anticipated big brother of the highly successful Sigma 35mm f/1.4 DG HSM Art lens, the 50mm f/1.4 Art left us awestruck with its OTUS-like, wide-open image quality. The lens is solidly built, looks great, and focuses quickly. For anyone looking for the highest quality 50mm autofocus lens, look no further – the Sigma 50mm f/1.4 Art lens is in a league of its own. Canon EF 16-35mm f/4L IS USM Lens – Announced in May alongside the EF-S 10-18mm f/4.5-5.6 IS STM, the EF 16-35mm f/4L IS USM became Canon's first wide angle, full-frame zoom lens with image stabilization. Once we got our hands on lens, we were immediately impressed with its corner to corner image quality. With remarkable image quality, an excellent IS implantation and a 77mm front filter size, this lens is proving to be an essential tool for many landscape photographers and DSLR video shooters. It has quickly become one of Bryan's favorite lenses to travel with. Canon EOS 7D Mark II DSLR – How about a 1D X autofocus system in a rugged, crop-sensor body that can shoot at 10 frames per second? Want a Dual Pixel Sensor allowing for great autofocus in video mode? Done. The original EOS 7D was a very popular camera for Canon shooters. So popular, in fact, that Canon kept producing it as a "current" camera for well over four years. The good news for Canon fans was that the EOS 7D's successor was worth the wait – the EOS 7D Mark II is an awesome camera. With a 65-Point All Cross Type AF system, 150,000-pixel RGB+IR 252-zone metering sensor, 10 frames-per-second burst rate, built-in intervalometer, Dual Pixel sensor and increased weather sealing, this will be the top camera choice among wildlife and sports shooters who can't justify the investment in Canon's top-of-the-line full-framer, the EOS 1D X. That said, the 7D II will also make a great second camera investment for anyone using an EOS 5D III as their primary body. For what it's worth, both Bryan and I have invested in EOS 7D IIs for our own personal imaging kits. Canon EF 100-400mm f/4.5-5.6L IS II USM Lens – Considering that the original Canon EF 100-400mm f/4.5-5.6L IS USM was first released in 1998, there's no wonder why there was such a pent up demand for an upgrade. Last month, Canon finally announced the aging lens's successor – the 100-400mm f/4.5-5.6L IS II USM – to much fanfare and excitement. With this lens in-house, it's impressed us with its image quality, improved IS system, and fast and accurate AF. Good things come to those who wait; and in this case, the long wait has led to a great lens for sports and wildlife shooters. 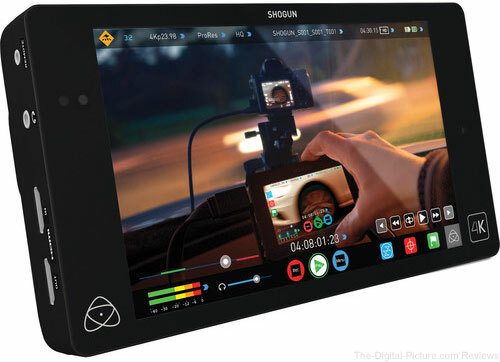 B&H has the Atomos Shogun 4K HDMI/12G-SDI Recorder and 7" Monitor in stock with free expedited shipping. The guys over at Rhino Camera Gear have created a fully illustrated PDF explaining how you can make the slider featured in the video above for around $75.00. Using the links above, just sign up for the Rhino Camera Gear email list in order to receive a download link for the free instructional PDF. From My Family to You and Yours, Merry Christmas 2014! My family and I wish you and yours the merriest Christmas and wish you love, joy and peace throughout the next year. Permalink: From My Family to You and Yours, Merry Christmas 2014! I know that many of you were waiting on this one: Image quality results from the Canon EOS 7D Mark II have now been added to Canon EF 100-400mm f/4.5-5.6L IS II USM Lens page. Again, preorder your Canon EF 100-400mm L IS II USM Lens now at B&H. 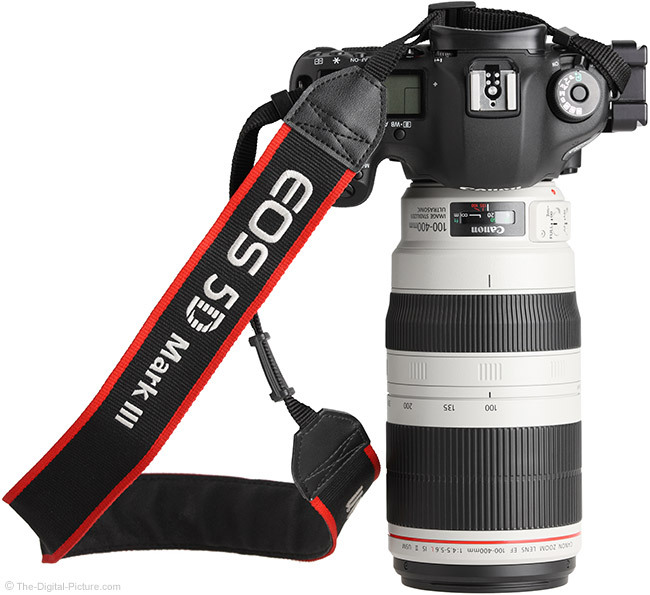 Image quality results from the Canon EOS 60D have now been added to Canon EF 100-400mm f/4.5-5.6L IS II USM Lens page. Here is a preloaded comparison between the version I and II lenses tested on the 60D. The difference is very noticeable. 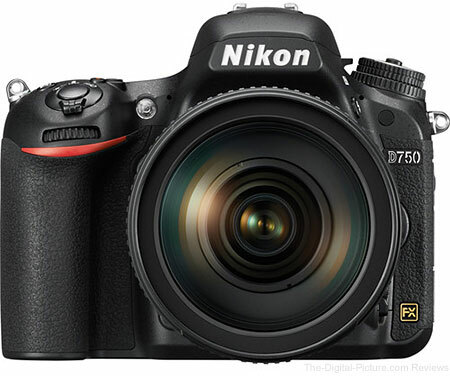 Next up: Image quality results from the EOS 7D Mark II. The 7D II is sharper at the same sharpness setting and this should be reflected in the results. 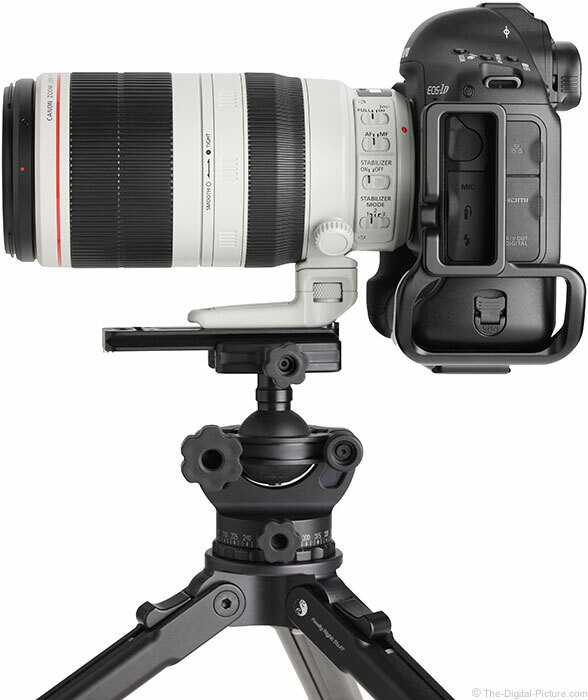 B&H has significant quantities of the Canon EF 100-400mm L IS II USM Lens arriving regularly. Do you still need a gift for the special photographer in your life? If so, I'm sure you're not alone. Here are a few ideas that qualify for free next day delivery . Image quality results from a second lens (presented as Sample 1) have been added to the Canon EF 100-400mm f/4.5-5.6L IS II USM Lens page. Again, I think that you are going to like what you see. Both lenses perform superbly and the two copies of this lens perform nearly identically. The second lens is very slightly sharper in the corners over part of the focal length range (look at the 200mm and 400mm samples to see this). Here is a preloaded comparison between the two lenses with the second lens presented as the default/left lens. Distortion and vignetting test results are also now available for this lens. 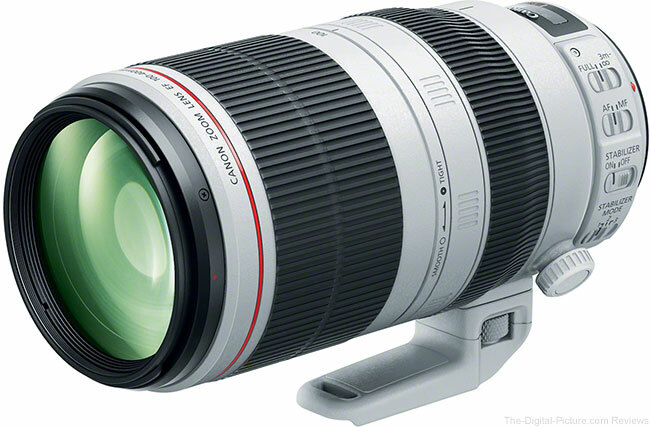 B&H has significant quantities of the Canon EF 100-400mm L IS II USM Lens arriving regularly. Demand has been very high.